Zippy little adaptation of the Capcom videogame that also functions as Miike’s most mainstream effort to date, and the marriage proves to be a fruitful one. 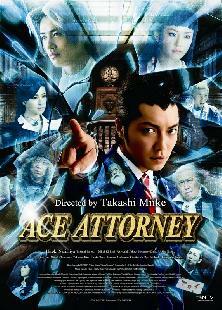 Ryuichi Naruhodo stars as Phoenix Wright, a struggling young defense attorney with a Woody Woodpecker hairstyle and sagging self image who takes on a big case against childhood friend and prosecuting prodigy Takumi Saito. Fun absurdist touches, futuristic set designs and enthusiastic performances, all supported by a clever mystery thriller script.